Sunshine Through the Rain: Slow going! I have been sewing recently - just slowly. Life has been full and busy, full of unexpected changes and interruptions, and sewing has had to be put to one side more often than not. However I have managed to put together a quilt top which, when quilted, will be a gift for a friends new baby. I pulled some Jay-Cyn Designs for Birch fabrics which I have been hoarding for a while and matched then with some other fabrics from my stash. I love the blue sashing - it is Bella Prussian Blue. The pattern is by Lynne from Lily's Quilts, and can be found in the superb Love Patchwork and Quilting magazine, issue 3. Now I just have to decide how to quilt it, and hopefully it will be finished by Thursday next week when I am going to visit my friend in Singapore, and I can gift it to her in person. Completing this quilt is my February Goal for A Lovely Year of Finishes. Linking up with Needle and Thread Thursday. It looks fantastic - your friend will be really chuffed. Have a fab time in Singapore! This is just superb. I love the pattern but.even more so l love the colours you have used. What a great gift. Good luck getting it done on time! What a wonderful quilt!! It reminds me of lead plate windows. I love the way you put it together and yes the sashing is a great color. Love it! How lucky to be able to give it in person! You can do it!! :) Have a wonderful time in Singapore! These are such lovely fabrics! I just have one fat quarter, think I'll have to keep it whole for a cushion back! What a pretty fabric color combo. Nice one. Great work! Your strips all look so straight and crisp! Love the color too. Lovely quilt and a February finish already doesn't sound too slow to me :) Your friend is a lucky lady! Love the non- white binding! I want to use white less in my future quilts. This is great! Love the color combos. I love the colours you have used. What a lovely gift. What a great quilt!! The Prussian blue is a wonderful choice of colour to set off the Jay Cyn fabrics. Good luck finishing it by Thursday. 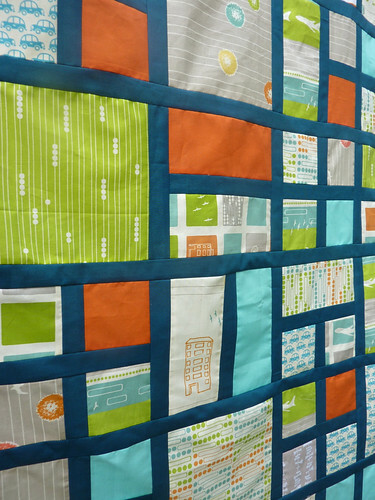 great colors in this quilt and I love the dark sashing! Wow, Singapore, I'm a teensy bit jealous! I am going to get some of that Prussian blue to have on hand. What a pretty shade of blue! I think you chose perfect fabrics for the squares!!! Love it! Isn't it amazing how different the same pattern looks using different fabrics? Hello! 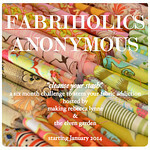 I picked your blog to visit from Sew and Sow Farm's followers! I especially enjoyed seeing this quilt. 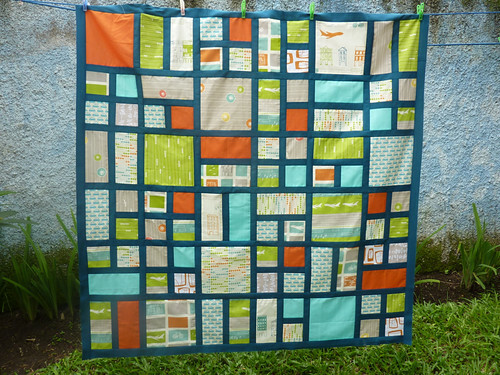 I love the organic birch fabrics, perfect for a baby. Your work is beautiful and inspiring!